Poland's Parliament has adopted Tuesday a declaration expressing support for the European integration of Ukraine and Ukrainians who have taken to the streets after the scrapping of an Association Agreement with the EU. In the resolution, the Sejm vows "full solidarity with the citizens of Ukraine, who with great determination show the world their desire to ensure their country's full membership in the EU." At the same time, Polish MPs have expressed "deep concern" about the exacebation of tension in Ukrainian political and social life. They called Ukrainian authorities to respect the principles of democracy, rule of law and the sovereignty of the people and refrain from any action that could lead to an escalation of violence. 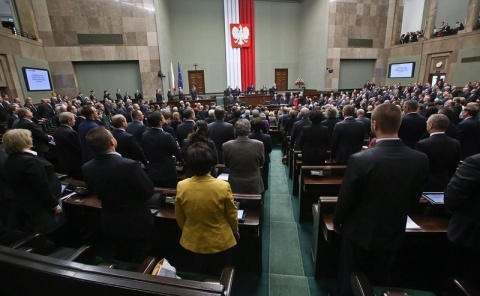 The Polish Parliament further expressed the hope political actors in Ukraine will ensure the peaceful running of rallies, and will unite in a consensus regarding the European future of their country. MPs also called the Parliaments of other EU countries to adopt measures to adopt policies to strengthen civil society in Poland, including visa facilitations for youth, cultural and NGO exchange. For the 13th day in a row this Tuesday, tens of thousands of Ukrainians have walked out on the streets of Kiev and many other major cities to protest the freezing of the EU Association Agreement by Ukraine's government. Many Ukrainians fear that this will move the country away from Europe and into an ever closing bond with Russia. The protests turned violent over the weekend, after protesters and riot police clashed, leaving dozens wounded. Senior Polish politicians, including Poland's President Bronislaw Komorowski and opposition leader and former PM Jaroslaw Kaczynski, have attended some of the pro-EU rallies in Ukraine. The EU Association Agreement was supposed to be signed at last Friday's EU Eastern Partnership summit held in Lithuania's capital Vilnius. The Easter Partnership initiative, spearheaded by Poland and Sweden, was launched by EU in 2009 in a bid to foster the gradual integration of former Soviet republics in Europe.